This is the only Orthodox church in St Francois County, Missouri. Desloge is approximately 65 miles south of St Louis. Take the Desloge exit. Travel west on Desloge Dr. Turn right at Oak St (first 4-way stop), go 2 blocks and turn left on Parkside. Go another 2 blocks and turn left of Walnut, then go one block and turn right on Brim. The Church is on the left side of Brim. No services are currently being held. Around the turn of the century Slavic immigrants started pouring into this area to work in the local lead mines. By 1906 there was a Uniate Church in Desloge, and in 1908 Archbishop Platon sent Fr John Gratson to start up an Orthodox parish, which attracted a sizeable portion of these miners and their families. One of the mining companies donated the land for the Church, the rectory, and the nearby cemetary. By 1916 the membership had grown to 320, with 53 children in the Church school, which met daily when public schools weren’t in season. But anti-immigrant sentiment came to a head in July 1917 when resentful miners rioted and drove out a significant portion of the parishoners. By 1918 the membership count was 75, and it never went up again. As time went on, the mines started closing down, with the remaining one closing in 1972. 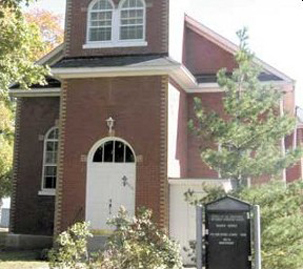 During the Great Depression the parish became vacant, and remained so for half a century. In the interim, it was serviced by visiting clergy from the St Louis area, most notably by Fr John Tertichny of St Michael’s in St Louis, and was maintained by a few faithful parishioners. In 1986 Fr Joseph Fester arrived, and during his nine years as rector he revitalized the liturgical life and refurbished the interior of the church. There are presently 30 adult members, most of whom are elderly, with a handful of younger families and singles. The prospects for growth are somewhat daunting, since the Orthodox presence in the area is very low - and this is not a major metropolitan area, although it is growing.